Medical students ripped open envelopes at noon Friday to discover where they would be pursuing residency. 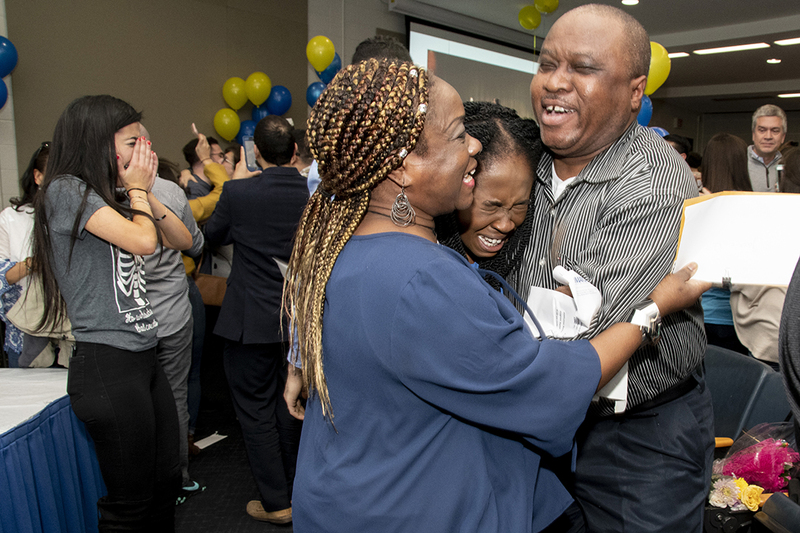 When the clock struck noon on Friday, George Washington University School of Medicine and Health Sciences (SMHS) fourth-year M.D. student Jacklyn Omorodion let out a scream and jumped in the air. Hugs from her mother and father followed. She had matched at her No. 1 choice for residency in combined pediatrics and genetics: Boston Children’s Hospital. Ms. Omorodion said she hopes to combine her passion for pediatrics with her undergraduate major of genetics. “After I did some electives and rotations here, I knew that’s what I wanted to do and there’s a lot of overlap between pediatrics and genetics,” she said. Every year students gather in Ross Hall, surrounded by family, friends and faculty to celebrate the milestone. 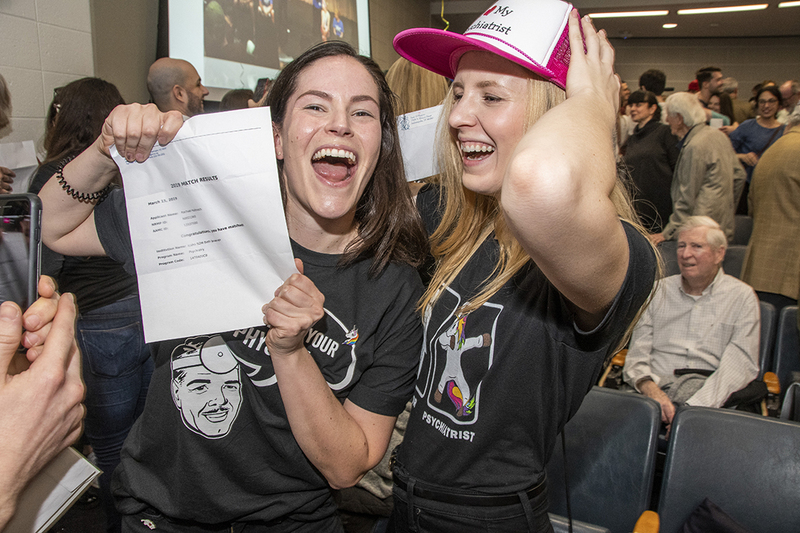 At noon, medical students across the country simultaneously receive and open their envelopes from the National Residency Matching Program, a nonprofit corporation established to provide a uniform date of appointment to positions in graduate medical education in the United States. “We’re truly excited for you, we’re proud of everything that you’ve accomplished, and our goal is for you to go out and make a difference. Make a difference in people’s lives, make a difference in communities where you serve and do us proud because we’re incredibly proud of you,” said SMHS Dean Jeffery S. Akman, M.D. ’81, vice president for health affairs, Walter A. Bloedorn Professor of Administrative Medicine. Richard J. Simons, senior associate dean for MD programs, wished the students well in their journeys. “We are confident when you go into your residency you will have a great foundation from which to start your training,” Dr. Simons said. Samuel Swenson, his wife, Tessa, and their children, 2-year-old Pierce and 4-month-old Lucy, were gathered together to find out at which orthopaedic residency program he would match. When asked if this moment was bittersweet after dedicating four years to medical school, Jené Carter said the sweet definitely outweighed the bitter, but that the past four years had been quite a journey. Ms. Carter is off on a new journey to the United Family Medicine residency program through the Allina Health System in St. Paul.